This is a below the knee, blue swing dress with white embroidred pattern featuring starfish, seaweed and clam shells. With a tea dress style featuring button up front, rounded collar and short sleeves. This is a 1940s style tea dress in pale blue featuring a lined knee length skirt with sheer, floaty overlay, fitted, elasticated waistband, black button up shirt bodice and sheer, capped sleeves. 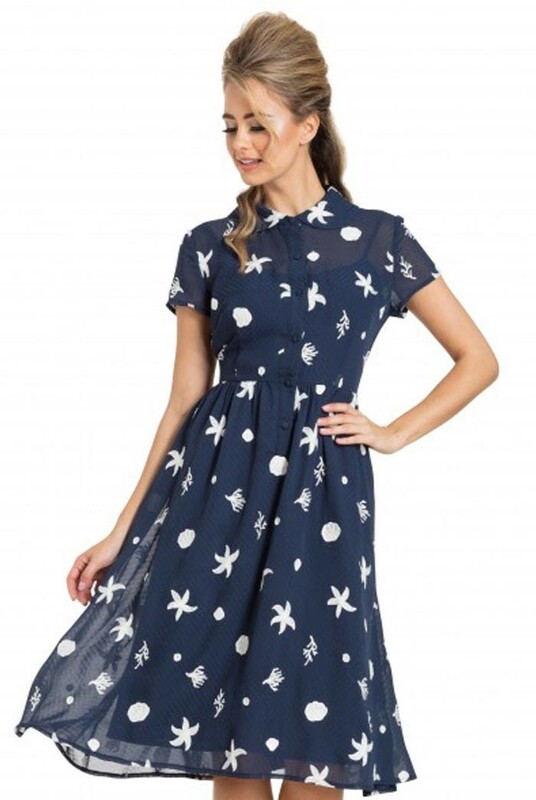 This forties number boasts a beautiful blue bird and branch print in black, blue, yellow and red and is made from polyester, is therefore machine washable. This is a below the knee, navy polka dot dress featuring button up front, fold down collar, cut out section to the back, fitted waist and flared skirt with all over yellow and green lemon print.